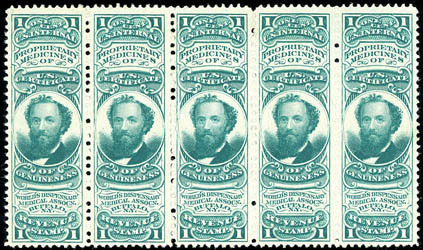 World's Dispensary Medical Assoc., 1¢ green, watermarked USIR, horizontal strip of 5, rich color, couple small thins affecting right pair, otherwise Very Fine, a very rare large multiple. Scott No. RS272d $138 for singles. 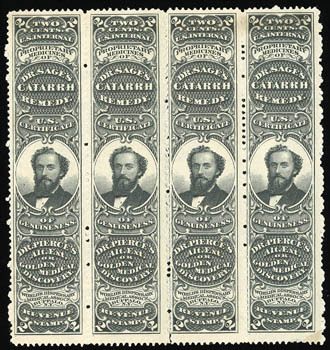 World's Dispensary Medical Assoc., 2¢ black, watermarked USIR, without gum, rich color and detailed impression, F.-V.F., a very rare multiple, mostly likely the largest known. Scott No. RS273d Estimate $150 - 200.